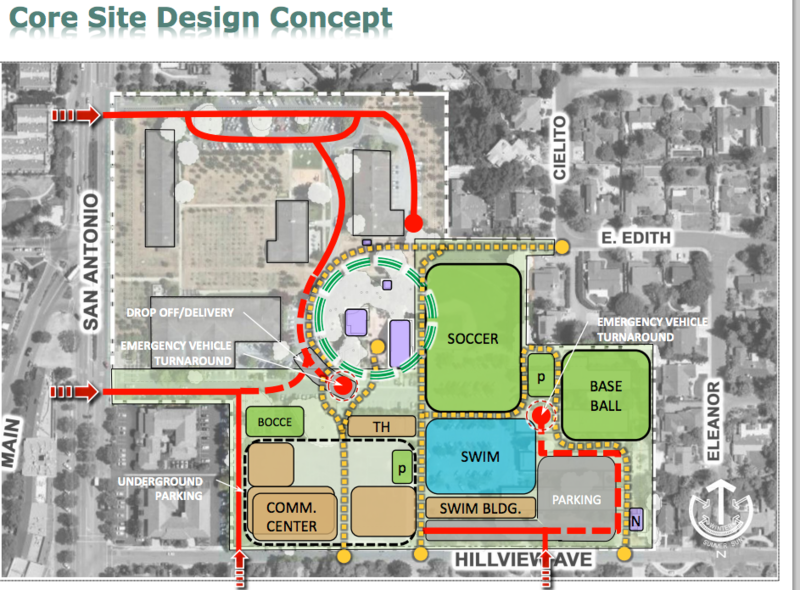 Additionally, this plan includes a new three-pool swimming complex and building. This project directs these facilities, traffic flow and access to be located on the southern residential border Civic property, and adds underground parking across the site. This revised project DOES NOT include any dollars $, upgrades, or construction for the Library, Civic Center and City Services, Theater, Police, ... on the Northeast quadrant, and does not add any plans for a Downtown connection or increased family Park areas, un-programmed fitness usage or exterior community gathering areas. Two micro play areas (P on map) are designated to total 1,297 square feet. Additionally, community-developed and directed Design Drivers developed for the 2009 Master Civic Plan were discarded and not used for planning development in this project. 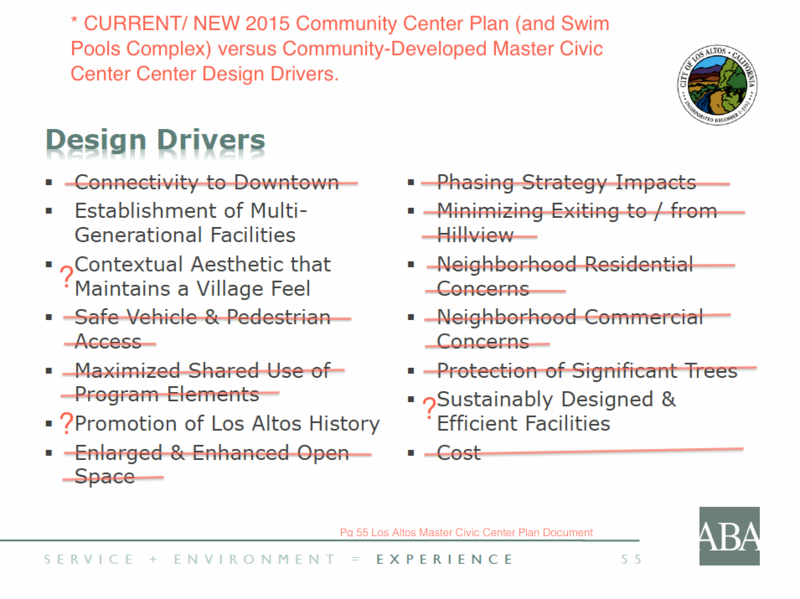 See how this plan stacks up to Los Altos Community Design Guidelines. The project will be funded out of a $60-$65 million general bond paid back through increased property taxes by every Los Altos resident. Property taxes will be paid for 30 years, and it is estimated that the total bond will cost $100-$150 Million over the life of the bond for interest, bond servicing and principal repayment. Additional funds of $27 Million dollars to be drawn out of City Reserves and Funds, including funds to repair sewer system, address downtown parking and address needed City upgrades. Over $1 million dollars has been spent to date on planning for the Master Civic property, of which very little was used in the preparation of this plan. Other city funds have been approved to hire a bond "consultant" to determine public education / marketing needs and whether this proposed plan can be made ready for a voter election on Nov 2015 ballot. The Bond Measure requires a 2/3 vote by Los Altos voter to approve this measure and tax. The election will likely be a mail-in election and will need a representative resident turnout to ensure it does not pass. VOTE NO. 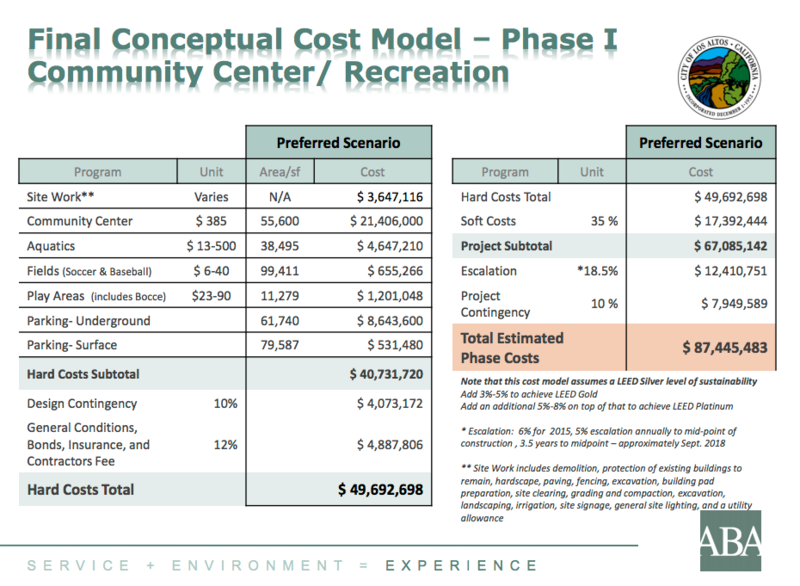 Current Cost Model for revised Phase 1 building on Civic Property. Includes planned buildings and square footage included for the build-out of this plan. DOES NOT include any ongoing maintenance, operating costs, insurance, etc for any of these buildings. July 26, 2015 City Council Meeting to Approve Nov 3, 2015 Bond Measure for $60-$65 Million Dollars paid back through a property tax increase for all Los Altos residents, to fund for a portion of the $87 Million Community Center project. August 7, 2015 November 2015 Bond Measure ballot submission deadline. November 3, 2015 Expected voter election to decide on Bond Measure and Plan.